The TVS Jupiter shares its name with both the king of Roman gods  the god of sky and thunder ? and the largest planet in our solar system. Suffice to say that it's a big name to live up to. It is, however, based on the Wego platform, and if that's anything to go by, living up to that name should be no hard task. The Wego was our Scooter of the Year in 2011, and we still rank it as one of the best scooters out there. 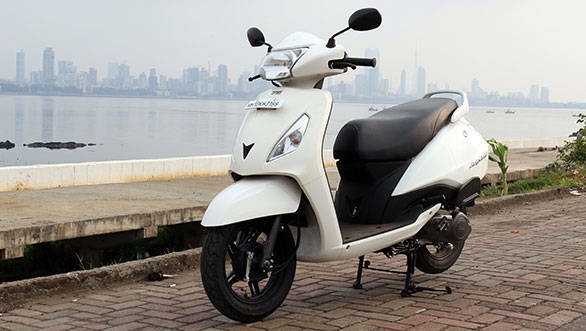 For starters, the Jupiter is quite a nice scooter to look at and seems to have been designed with a more universal appeal in mind as compared to the other automatics in the TVS stable. It's a design dominated by clean lines, and though it does appear to be a larger scooter than the Wego, it's only 10mm wider and no longer than its older sibling. 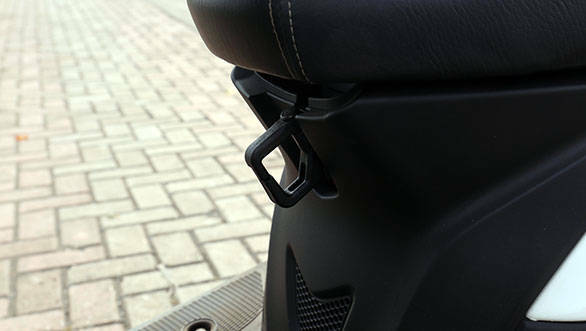 On closer inspection, you will notice that the front storage compartment from the Wego is missing, and this allows for a much roomier seating position. TVS have now included two retractable bag hooks ? one hidden under the head unit and the other positioned under the pivot point of the seat ? that can be folded away when not in use. 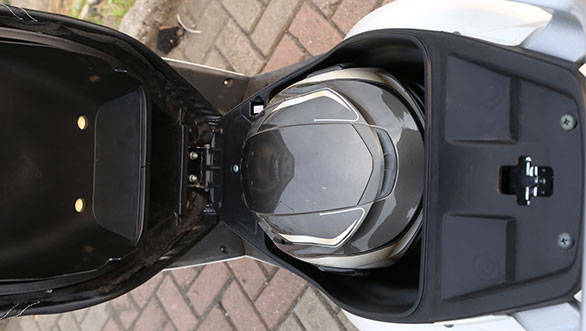 The 17 litre under seat storage was large enough to take a half face helmet. There's also a mobile charging socket located to the left of the ignition switch. 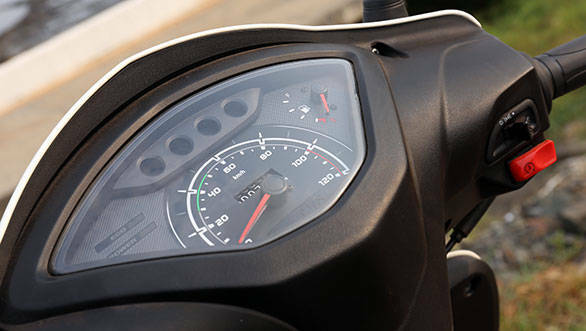 The instrumentation cluster is new with a set of four tell-tale lights (for indicators, fuel and high beam) sitting on top of a large round speedometer. To the right is a fuel gauge, while to the left of the speedometer lies what TVS are calling an Econometer. 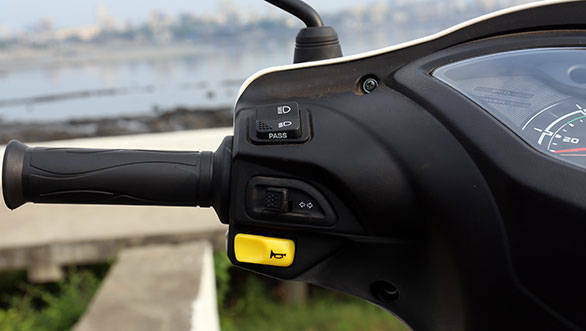 It's a set of two lights: green for when you are riding in eco mode and orange when you are in power mode, similar to the ones seen on the Scooty series and the now defunct Victor bike. This is basically a throttle position based indicator showing when you are consuming more fuel by wringing the throttle open too quickly. 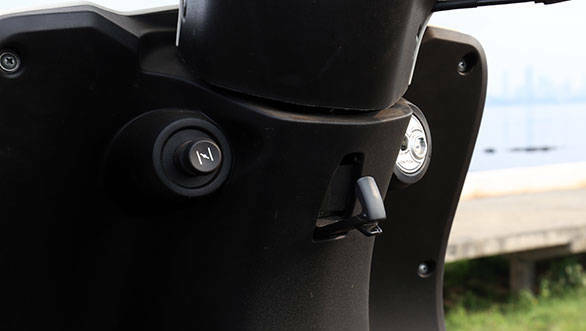 The fit and feel of the panels and switch gear is quite good, and similar to those on the Wego, except now the high-low beam switch also has the pass light cleverly integrated into it. However, there a few things I found that could do with some improvement. The fuel filler cap looks a little industrial and the materials used don't quite match up to the rest of the scooter. Also on the bike that we received, the colour (pristine white) of all the panels didn't quite match each other. Moving on to the engine, it's the same 110cc unit from the Wego and makes identical figures  8PS at 7500rpm and 8Nm at 5500rpm. It's smooth in operation and feels decently powerful too.The improvements in the engine include the ability to warm up quicker, a full 3D ignition map and a lot of work towards reducing fiction, all of which contributes to better fuel economy. It remains smooth in operation and feels decently powerful too. TVS claims a 0-60kmph timing of 7.2 seconds, and going purely with a seat-of-the-pants feel, it could well live up to that claim. But we'll test that claim properly at a later date. 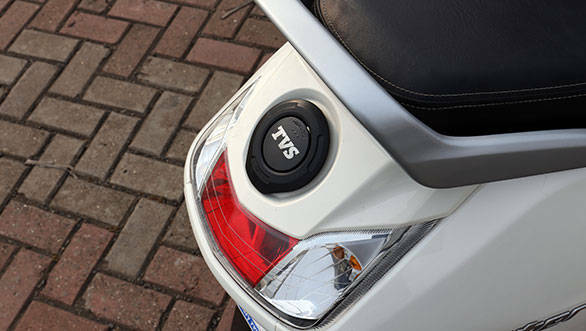 We will also be putting to test TVS's claims of a 62kmpl (standard conditions) fuel efficiency for the scooter. If the real world figure is anywhere near that, it could make the Jupiter one of the most fuel-efficient scooters in the market. 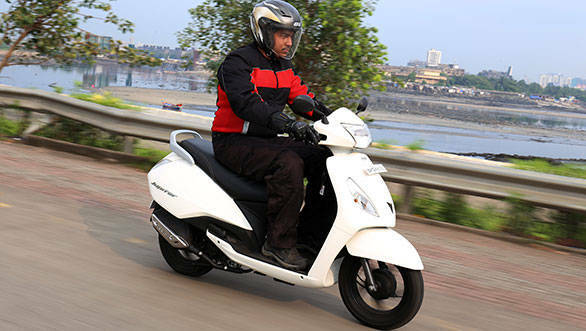 These engine changes will also be rolled out on the Wego next month. 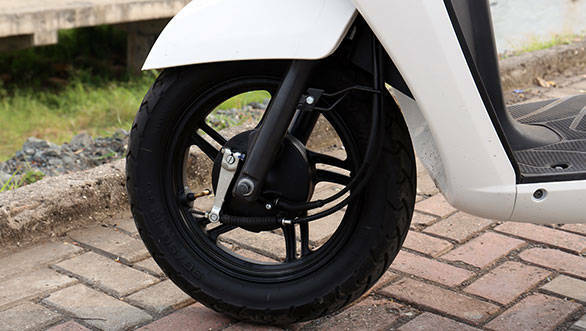 The Wego is known for its great ride quality and handling, and the Jupiter with its 12-inch alloy rims (compared to the 10-inch alloys on most other scooters) and telescopic front forks follows in the Wego's footsteps. It has great ride quality and over the potholed roads of Mumbai, the Jupiter remained composed even when pushed hard. The steering is quite light and together with the great ride quality the Jupiter makes for an excellent city scooter, allowing me to weave through a traffic snarl with no problems whatsoever. 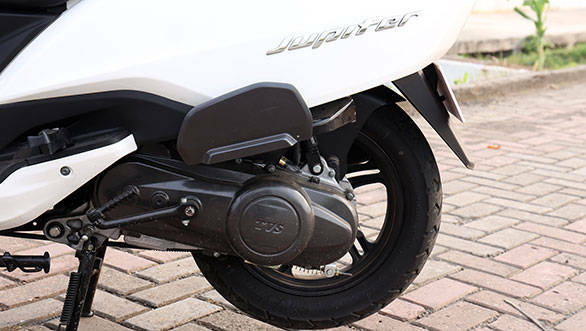 The Jupiter is positioned one notch below the Wego, and thus only features drum brakes (front and rear) at the moment. But since it shares the same front end with the Wego, a disc could be offered as an option at a later date. The 110cc segment is where all the action is at the moment with a host of new models in the fray, and priced at Rs 46,354 ex-Pune, the Jupiter lands right in the middle of the mix. Our short ride has shown us that the Jupiter has quite a few things going for it with its pleasing looks and great ride quality. If it can live up to its claims in performance and mileage, then we could easily see it becoming a segment leader.